Collecting antique slot machines is an expensive hobby that requires a good knowledge of antique slot machine values for the serious collector. These machines not only make beautiful antique decorations, you can still play the games on them as well. The more original parts an antique slot machine has, the more value it holds. A real antique machine should have a serial number, unlike a reproduction slot machine. Reputable antique slot machine dealers will usually offer a certificate of authenticity with the machine. Most antique machines have been refurbished. This involves taking the machines apart to clean and re-lubricate all the internal working parts. Damaged or lost parts are replaced and the machine is then reassembled. Many other states allow the ownership of slot machines with certain restrictions. For instance, in California, Delaware, Montana and a number of other states, you can own a slot machine that is 25 years or older. New Jersey and Pennsylvania laws allow ownership of slot machines that were manufactured prior to 1941. Machines manufactured before 1952 are legal in Washington D.C. and machines manufactured before 1954 are legal in Vermont, as long as they are not used for gambling. Make sure you have researched your local state, city and county laws before purchasing a slot machine. The best place to start your research for antique slot machine values is online. There are websites that offer price guide information, as well as dealers and private collectors that offer information and advice about buying and selling antique slot machines. The Antique Slot Machine Price Guide is an online database with over 8000 slot machines and the prices they have sold for on auctions such as eBay, Victorian Casino Auctions, James D. Julia Auctions and Inman Auctions. You must subscribe to be able to see prices for antique slot machines. A twelve month unlimited subscription will cost $139.95, or you can get a 14 day trial for $39.95. Antique Slot Machines was started by Bob Levy, who claims to be one of the largest dealers of antique slot machines in the United States. Levy deals exclusively with vintage machines from the 1920's, 1930's, 1940's and a few from the 1950's. You can get an official written appraisal for your antique slot machine from Mr. Levy for a fee of $50. 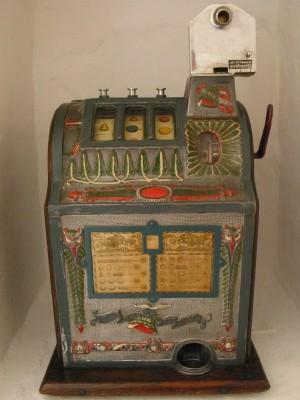 Here you can also view Bob Levy's private collection of vintage slot machines or look for one to purchase yourself. Chicago Slots has been in the antique slot machine business for over 22 years. This company can tell you how old your machine is and always pays fair market value for the machines they buy. Chicago Slots will provide price guide information on antique slot machines and provide references. They are willing to travel to pick up a machine or will send someone to pick it up. Chicago Slots has relationships with many shipping and packing companies around the country and can often arrange to have your machine professionally packaged and shipped. This company will also pay a finder's fee for any lead that results in the purchase of an antique slot machine. If you should see a machine for sale in an antique shop or at a flea market, you can call Chicago Slots and earn money just by sharing information that leads them to purchase a slot machine.